Irony was the hallmark of the last two days of the return trip from Edwardsville. With the exception of some chilly, rainy days during the conference itself, the temperatures for most of the trip were delightfully warm. In fact, my dearest friend and I even had an opportunity to dust off the old picnic basket. That all changed when we got to New Mexico. After a restful night at the Roadrunner Lodge, our morning in Tucumcari kicked off with some sunrise photography, a bit of exploration, and a stiffening breeze that had a very definite chill. Next came some breakfast and conversation shared with Kevin Mueller of the Blue Swallow Motel (Nancy had to cancel resultant of customer issues) at Kix on 66, and a cruise through town in his Model A Ford truck. Afterwards we rolled west into a brutal headwind that grew in intensity with the passing of every mile. In spite of the winds we kept a leisurely pace and made a few stops for photography. However, by the time we made Clines Corner the wind was howling. With the temperature hovering just below the freezing mark, the chill factor had to be near zero. That provided a bit of incentive for foregoing stops for pictures and simply driving, at least until we arrived in Albuquerque where it was just a bit warmer. After another cruise along Central Avenue, and a stop for lunch at Loyola’s, we continued the homeward cruise. 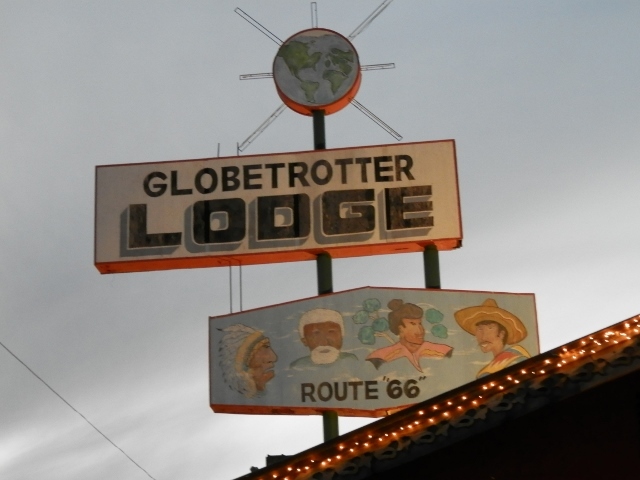 The days destination was Holbrook and the Globetrotter Lodge, another one of our favorite roadside oasis. As we motored west from the Rio Grande Valley our interest in photography declined in direct correlation to the falling temperatures and the amount of snow on the ground as we neared Grants. What is wrong with this picture? On our last day in Illinois it was seventy degrees! With the exception of a few icy patches the road was clear and dry. Still as we neared the Arizona line, and the snow blanketed the ground rather than nestled in the shadows, I found myself longing for our trusty old Jeep. As had become our custom on this trip, we arrived at the Globetrotter Lodge as the last light of the day was fading from the sky. After visiting with Peter, the charming proprietor, and checking in, we set out in search of some Mexican food at Romos Cafe. Even though we had spent most of the day on the sterile old four lane highway, this was still a Route 66 adventure. So, surprises were to be expected. In this instance it was a chance meeting with David Heward, and some of his amigos who stopped in for dinner. Before I forget, thank you Eddison for dinner. Conversation, a beer or two, and some excellent food brought the day to a close. The following morning dawned clear, and cold, with the temperature just south of 20 degrees. As it was November, winter weather was to be expected but that didn’t mean that I had to enjoy it. From Holbrook west, we had but one option as I was scheduled to meet a group from Hop a Long Tours, a Norway based company, at noon n Kingman. That left us with but one option, I-40. Still, we did take the time for a very brief stop at Two Guns for some photos with the snow capped San Francisco Peaks as a backdrop. Overall it was a delightful adventure. As always, we didn’t have time to visit with all of the friends made over the years in our Route 66 travels, and we weren’t able to stop at each of our favorite places. That provides ample excuse for another road trip. Likewise with the fact that we discovered new places well worth a return trip, and made a few new friends. To everyone that we missed, we will catch you on the next trip, unless you stop in Kingman first.